We arrived in Camas, Washington in the evening and were immediately delighted by the quaint downtown. Here we found the well-maintained tree-lined streets aglow with soft rope-lights. We intended for Camas to be our home base while exploring Portland, only a 25-minute drive away. However, Camas quickly charmed us in its own right offering curb appeal, a diversity of restaurants and brewpubs and ease of walkability. 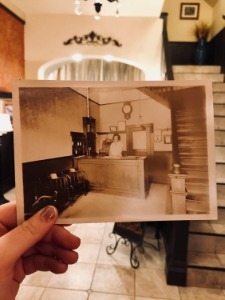 ​The historic Camas Hotel sits proudly on the corner of main street right in the middle of downtown. We were greeted by the friendly hotel staff, offered a coupon booklet with local deals and a parking pass valid for free parking in their guest lot. 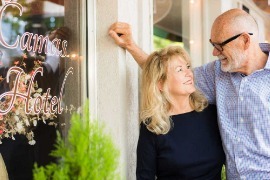 ​The Camas Hotel conveniently offers rooms for all budgets. We tried both the European style bedroom and en-suite bedroom during our stay. Both rooms were clean and comfortable with coffee, seating areas, and thoughtful small touches highlighting the history of the area. Each floor of the hotel features a community kitchenette stocked with kitchen basics for those looking to prep their own food. The European style room made us nostalgic for our travels in Europe where sharing a bathroom is a perfectly acceptable and sustainable practice. The European style rooms, sans bathroom, boast their own vanity sinks, so brushing your teeth and washing your face can done in the privacy of your own room. There are two spacious communal bathrooms on each floor, each containing a shower, sink, and toilet. We found the bathrooms clean and inviting. Not once did we experience a wait. Our ensuite bedroom was charming with that quintessential boutique hotel feel. While having our own bathroom initially sounded convenient, after our hassle-free experience using the communal bathrooms, we found the private bathroom to be superfluous. For those planning to spend the bulk of their days getting out and exploring Camas and Portland the absence of a private bathroom will largely go unnoticed! Continental breakfast was served each morning in the sunny second floor atrium. The tasty breakfast spread includes cereals, fruits, eggs, yogurt, toast, pastries, juice, coffee, and teas. Over coffee we chatted with friendly guests who remarked on their pleasant stay. Among my favorite places in the world are the beautiful, historic Camas and Washougal, Washington located along the exceptionally magnificent and breath-taking Columbia River Gorge, near Vancouver, Washington. I lived between the two towns as a little child, and have longed to return. 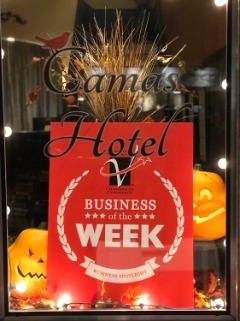 You can imagine my exuberance at discovering the equally magnificent Camas Hotel right downtown Camas, Washington. My sister and I checked in one evening for a three nights stay. 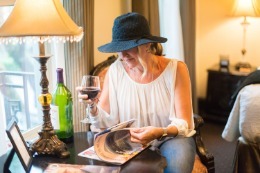 It was in the month of October and even though it was “oﬀ season” We were welcomed to our Queen Luxury Suite with what I consider unusual warmth and kindness. The friendly staﬀ pampered us the whole time we were there. The room was exquisite, and very clean. White robes were waiting for us in the bathroom. Also, we really enjoyed the heart-warming street view out our window. You would never know it was “oﬀ Season” by the awesome complimentary brunch and great food we were served in the Atrium every day. What an experience! We will definitely revisit The Camas-Luxury Boutique Hotel, again soon! This place is definitely a 10! Reasons to Stay at the Camas Hotel! ​In need of a date night? We suggest Room #3 for your romantic getaway! Sun – Thurs free movie tickets to the Liberty Theater, and $20 off your meal at Hey Jack with your complimentary Keys to Camas! Sounds like the perfect date night to us! 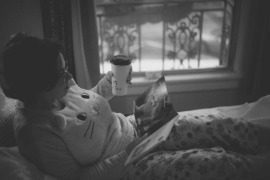 ​Sometimes we all just need a little “me time”. What better way to treat yourself than a night at the Camas Hotel? With complimentary deluxe xfinity channels, such as HBO and Showtime, its easy to kick back and relax here. So pack your bags, kick up your feet, and stay with us! The idea of Business travel doesn’t exactly scream “luxury” to most. But we’re trying to change that. Many restaurants and bars are within walking distance of The Camas Hotel. 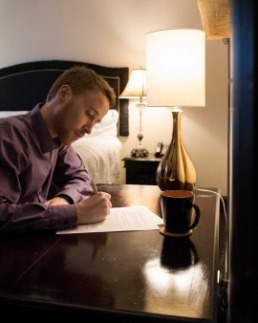 We offer free wifi, free parking, and complimentary continental breakfast, perfect for any on-the-go business traveler. ​Start your staycation with us! Grab your friends and enjoy a night out in Camas! We suggest choosing from our selection of adjoining rooms for your staycation! Sip, Shop, Play and Stay! ​ “Happy October from your favorite Pacific Northwest Historic Hotel!